Morra Aarons-Mele is a successful woman by any standard. She founded a consulting agency that works on presidential campaigns, but she is also an introvert who had frequent panic attacks and hid from her colleagues at networking events. 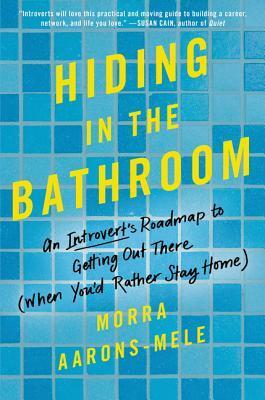 In Hiding in the Bathroom, she shows readers the proof that successful people don't have to be bombastic and spend every minute focused on their career to the detriment of everything else. Aarons-Mele gives advice to the rest of us: the people with anxiety who want to be CEOs, the introverts who want to run a company but hate networking, and the parent who wants to find success in their field and still spend time with their kids. This is a book for people who work in certain fields; there are some jobs where you just don't have a lot of wiggle room. But if you are in the kind of profession where you control some aspects of your job, this is a great book. This book has chapters about dealing with FOMO (fear of missing out, for those like me who don't know the lingo), leaning in less to find the things that are priorities and the things you can let go, and finding the right job to fit your hermit ways. I also appreciated that she covered things like negotiating and sales--if you're an introvert like me, those things can quickly send you into a panic. But if they are a part of your job, you need to know how to deal with them without crying under your desk every time. I'm pretty new to reading books about strengthening your career like this one, but a point I've seen a few times is that we are doing damage to ourselves and our workplaces when we only think about work-life balance as a downside to parenting. People also need balance to do things like have hobbies, care for their parents, or even just spend a few quiet hours at home without worrying the boss will call you at midnight. "I'm going to say it again: control over pace, place, and space is NOT a mommy issue! Everyone has their own work+life fit, and if you're an introvert, yours may not include sitting in an open-plan office fifty hours a week. If you love your career and you want to stay in it, don't let lack of flexibility or a poor work+life fit chase you out! Remember what workplace expert Cali Yost says: most mangers feel shocked when employees quit over a work+life conflict. They don't want you to leave. So next time you're chafing against silly face-time rules, think like a boss and take what you need." This is a realistic book; the author admits realizes that this advice is not for every person or every career and that some newer employees have to prove their commitment before they can shift what their boss expects. But she also believes that people work best under different circumstances; if we as bosses and employees want the best work possible, shouldn't allow the flexibility for all people to excel? It sounds like an interesting book. For a long time, I thought I was an introvert because I'm on the quiet side, but now I think I'm a shy extrovert (but I don't really understand the distinctions!). It takes me a long time to warm up to social interaction, but once I do, I thrive off of it and feel sorry when it's over. It's so fascinating, isn't it?? I think most people would think I'm an extrovert because I have music/theatre training and I'm good at leading. But really I need some quiet alone time to recharge! This would definitely meet that criteria! It's so fascinating that we don't think of speaking up about some of these things when they don't work for us.